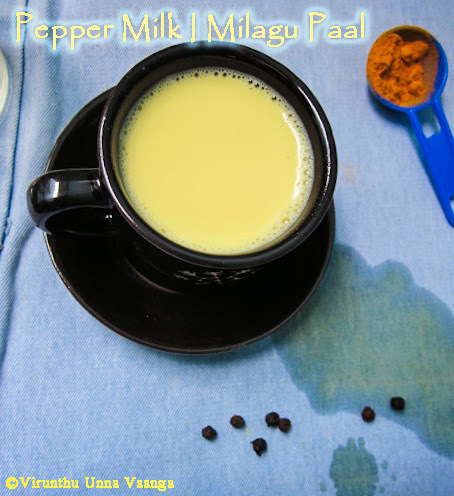 Hello friends, today’s post are a spicy drink, pepper milk or Milagu Paal, this hot milk is such a perfect remedy for cold and cough. My mom used to make out whenever we suffer from cold and cough. 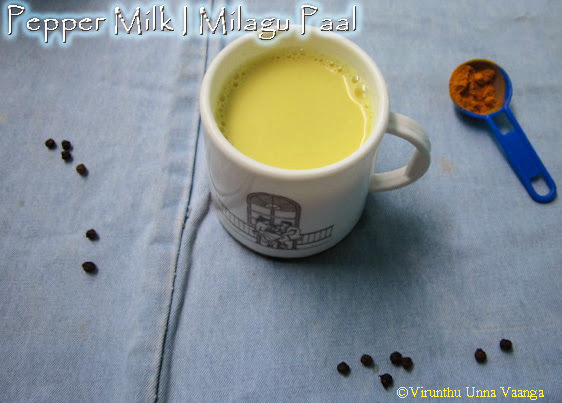 Its simple yet very valuable spicy drink prepared with hot milk, turmeric, pepper, cardamom and honey or panam karkandu (Palm Sugar) or white sugar. It gives super effect against cold and cough; I used to have the medicinal drink when I get cold. Nothing will beat the milk which sooth immediately the nose, throat. The drink can be had after dinner as it will include good sleep, clear phlegm, cut down irritation in throat and make you feel relieved. 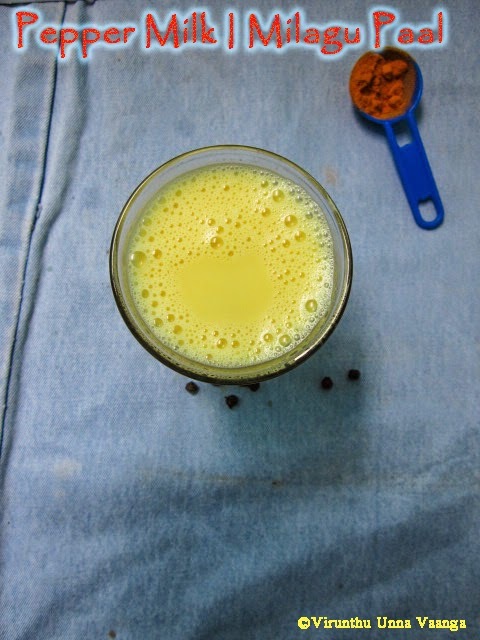 The aroma of turmeric and cardamom boiling along with milk hit our nostrils. There are three different curcuminoids present in turmeric they are diferuloylmethane, demethoxycurcumin and bisdemethoxycurcumin. Of the three diferuloylmethane is present in higher amounts and is responsible for the color and medicinal value of the herb. Curcumin serves as an anti-inflammatory agent and also possess anti-bacterial and anti-viral action. These properties of turmeric aid in treatment of bacterial and viral infections such as cough and cold. The anti-inflammatory action of curcumin aids in relieving the chest congestion that develops in people suffering with chronic cough. It has been considered a wonderful healing agent for ages. It is a sweet and viscous fluid made by honey bees from the nectar of flowers. Honey comes in a variety of colors, from almost white down to darker colors such as amber, red, or brown. Honey is considered to be one of the best natural remedies for sore throats, coughs and general cold symptoms. Honey has long been used in various natural sore throat remedies ranging from teas to syrups. Even today many commercial preparations for sore throats and coughs (such as lozenges) are still primarily based on honey. Pepper is added in tonics for cold and cough. Pepper gives relief from sinusitis and nasal congestion. The antibacterial property of black pepper helps to fight against infections, insect bites etc. Cardamom is an effective remedy for cold & cough caused due to throat irritation. It helps dilution of thick cough and its allied problems like bronchial congestion providing a demulcent and soothing effect on respiratory tract. It prevents reflex coughing and stimulates normal mucous secretion. 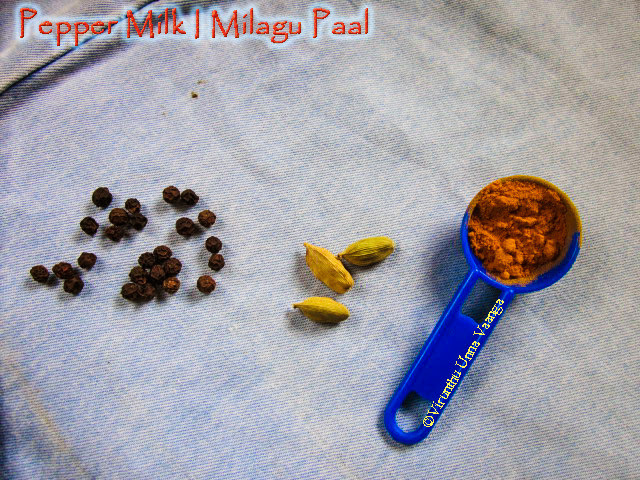 Crush the peppercorn and cardamom seeds in mortar and pestle or mixer. Pour milk in a sauce pan, add turmeric powder let it boil for 1 minute. Add the crushed pepper and cardamom boil it for 30 seconds and strain it. Now add honey to your taste stir it once. 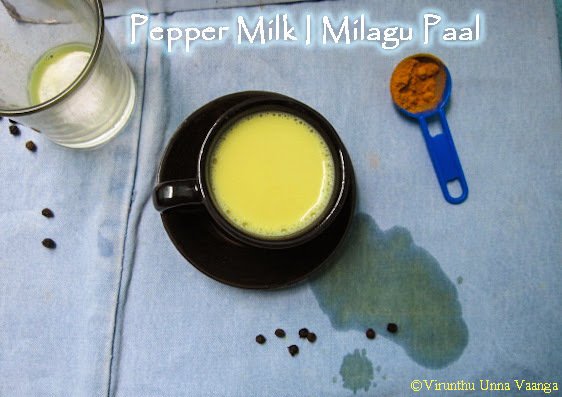 Drink hot pepper milk for your cold and cough. 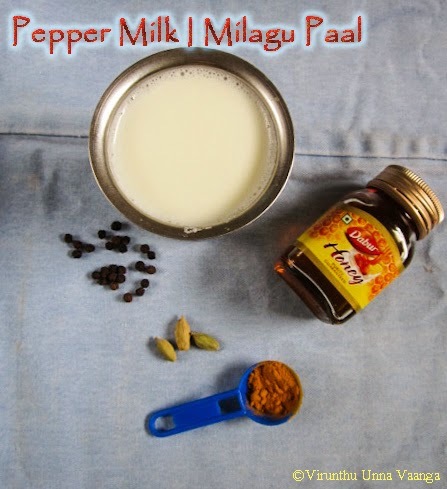 HOT N SPICY PEPPER MILK!!! Add pinch of dry ginger to get extra medicinal effect. Add saffron if you like the flavor. we dont add cardamom da.. perfect cure for cold..
wow such a nice,perfect drink to have when we have cold..
My mom makes pepper milk too when I get cold.. but doesnt add cardamom & honey. Love this milk with medicinal properties..
healthy drink n nice cliks.